As you all know, Halloween was yesterday and trick or treat took places at random times before that. We got lucky enough to take Little Man trick or treating twice this year. Last year, we just sat on my dad’s porch and handed out candy. 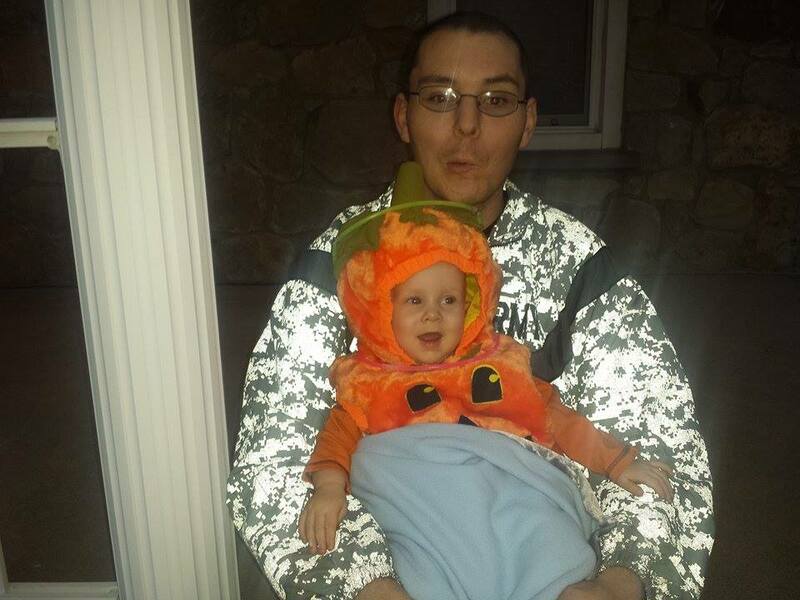 He was an adorable little pumpkin and he absolutely loved seeing all the kids in their costumes. He is definitely a people person. 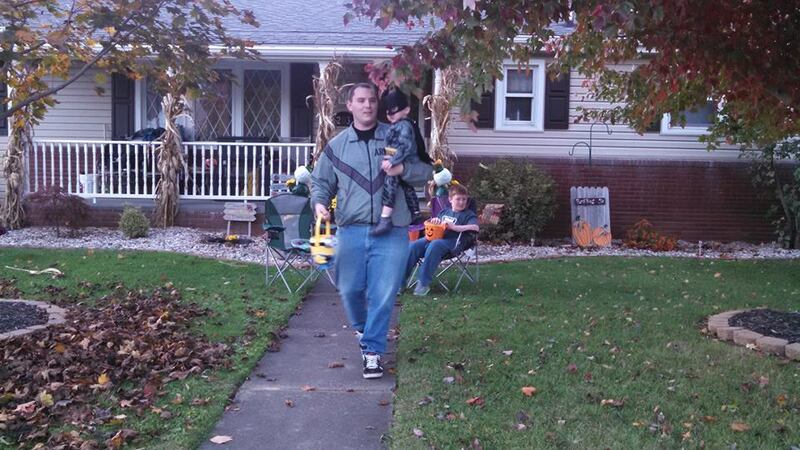 This year, we went to my husband’s parents’ house on Thursday for trick or treat in their town. Little Man walked for some of it but was carried for most. He can’t quite say “trick or treat” yet, but he said “hi” when he walked up to the house and “thank you” and “bye” after they put the candy in his bucket. Of course, he was smiling the whole time and the weather was perfect for walking around to trick or treat. His mask stayed on the whole hour, we were extremely surprised. Then we went in our town yesterday. Little Man rode in his stroller for the whole thing and was loving life. He saw multiple dogs and was freaking out about those more than he was about getting candy. The mask only lasted about 10 minutes last night and he wouldn’t let me put it back on. The weather was a few degrees warmer than Thursday, but still a gorgeous night. He was wired after trick or treating, so we sat at my dad’s and Little Man played with his best friends, Skye and Odin, two pitbulls that are under 2 years old. Now time for my rant, if you don’t like people ranting, skip this paragraph. I absolutely cannot stand some people. 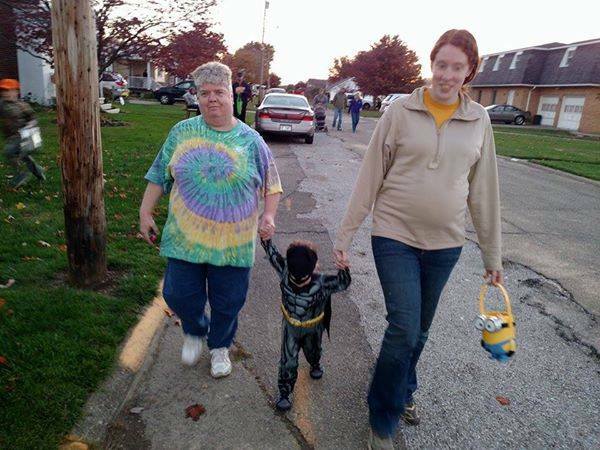 When we were trick or treating on Thursday, I saw a GIRL (she looked about 12) who was PREGNANT and trick or treating! 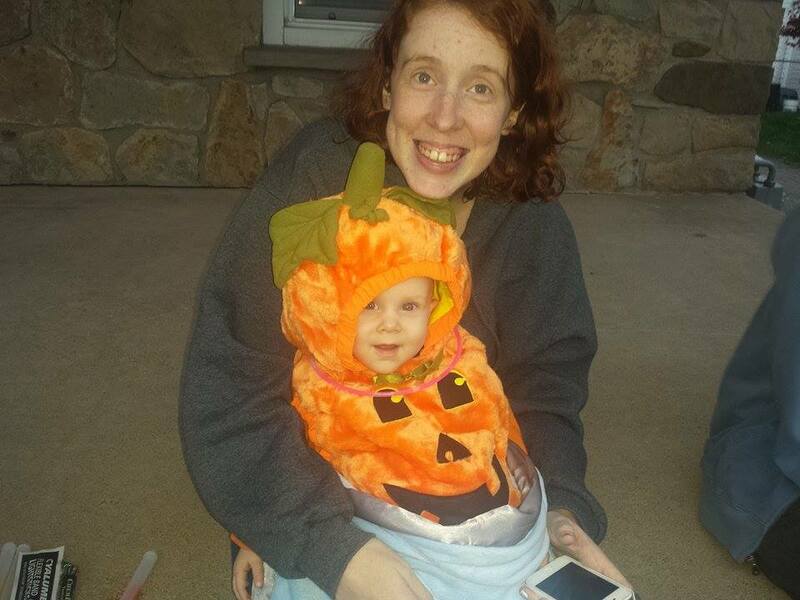 Yes, I am pregnant and I was trick or treating, but not for myself like she was. My mind was BLOWN when I saw this girl! I swear to you, my jaw hung to the ground. Then as we were trick or treating last night, I heard a kid say “I have to walk all the way over there to get candy?” SERIOUSLY?!?! It’s FREE candy, why are you complaining about getting some exercise on a beautiful night that only comes around one time a year?!?! The last week was eventful to say the least. In an attempt to start a family tradition, we sat down to watch Hocus Pocus on Wednesday night. Little Man seriously lasted 20 minutes, then passed out. In his defense though, he is teething and it is AWFUL! 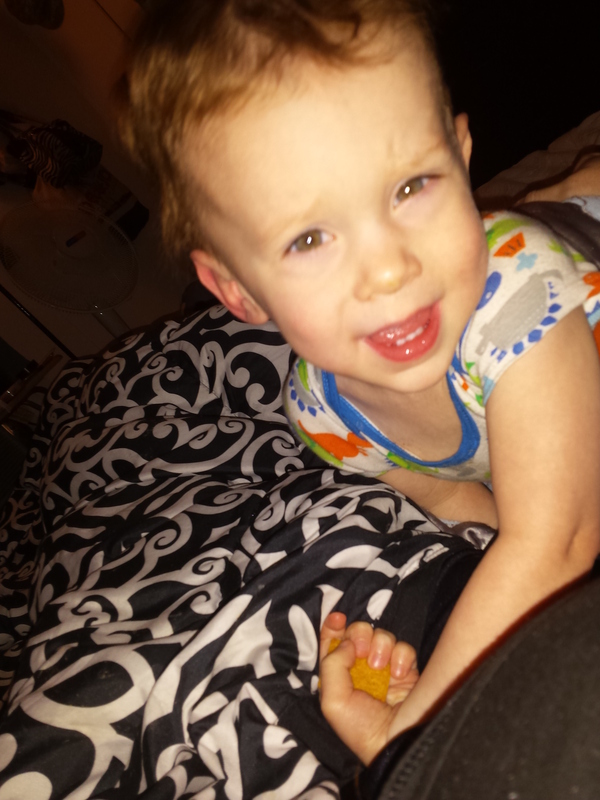 We’re talking multiple fevers of 101, chewing on everything, sleeping all the time (as long as he’s near Mommy), all sorts of terrible stuff that you absolutely hate to see your kids go through. Little Man also got his last shot until he’s 5 this week, so we have a break from shots for a bit, then when our new little guy is born, we’ll start the horrible shot procedure all over again. I’m 32 weeks pregnant as of this past Friday, so less than 8 weeks (hopefully!) until we meet our new little guy and see how much like his big brother he is. I’m hoping his personality is a bit the same but mostly different, I don’t think I can deal with two crazy little guys running around. This is how he spent Wednesday and Thursday. He’s still a happy little guy even though he’s sick. Taking Little Man to school on Monday turned into a big joke! For a bit of backstory, the teachers at the school arrive around 8 am and the students are supposed to be there around 8:30. I’m normally there around 8:20, but I sit there and play with him until breakfast time at 9. When we got to the school, there were two fire trucks parked outside and the teachers were standing outside. We soon found out that when they got there that morning, someone smelled plastic burning so the fire department was called. Later, the head start decided that although the fire department had said the building was fine, the electric company had to be called in, so school was cancelled for the day. 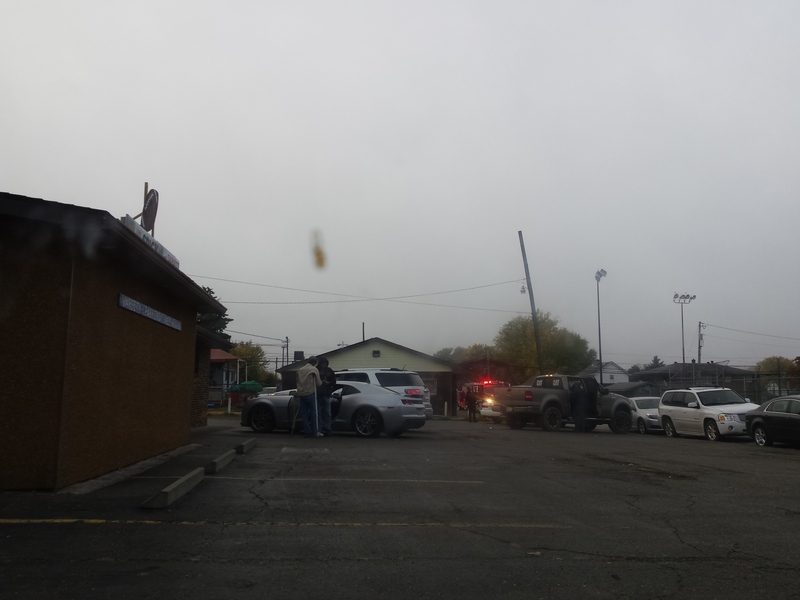 Tuesday, school was cancelled so the health department could come check the building. 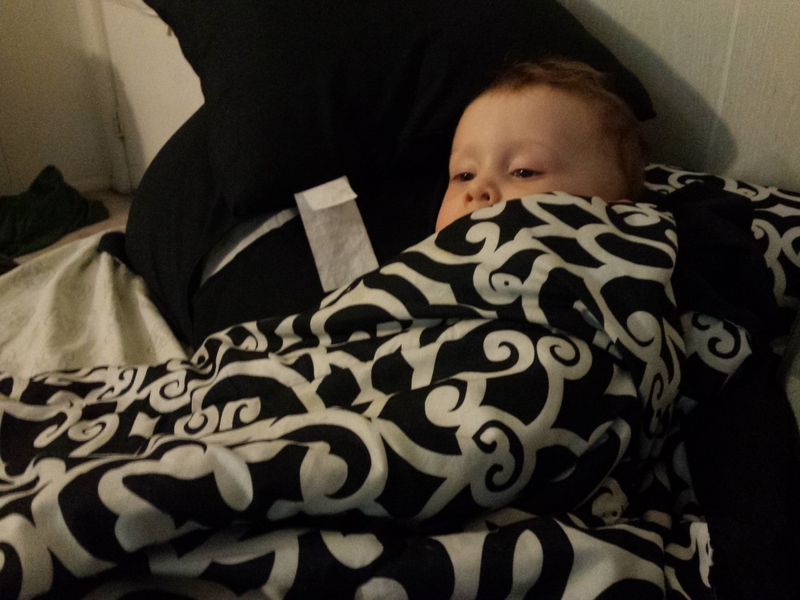 Wednesday and Thursday, Little Man had a fever and was not feeling good due to teething so he didn’t go either of those days. Tomorrow, he WILL be going to school unless his fever comes back, which hopefully it won’t since it’s been gone since Thursday afternoon. 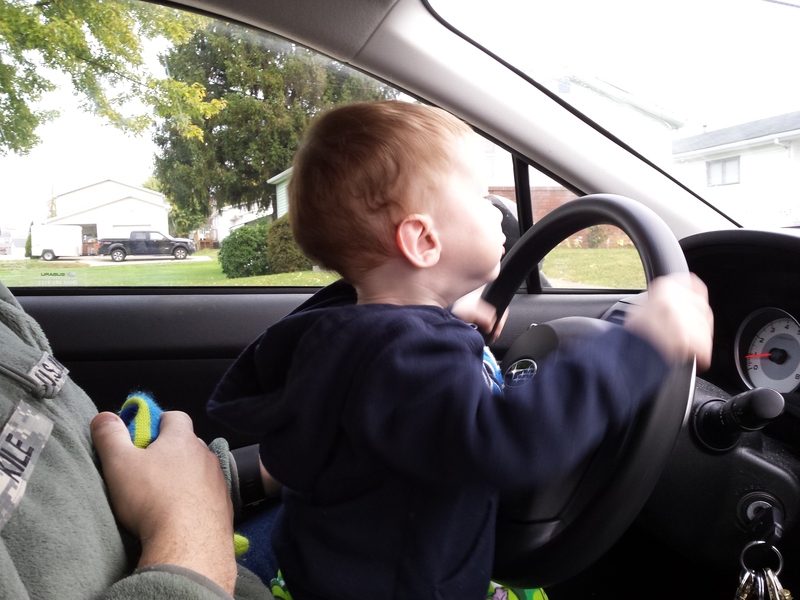 So Daddy taught him to drive (not really) while we waited. Well, that was a lot more than I had intended to type but I guess a lot happened this week. How was your Halloween/trick or treat? How did October finish out for you? Let me know! Hocus Pocus is on NINE times this year on 13 Nights of Halloween on ABC Family! 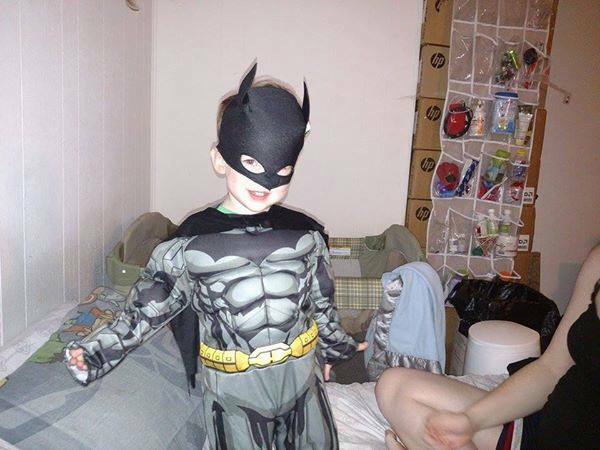 This will be Little Man’s first year trick or treating and he is going to be Batman! I’m two months away from my second little guy arriving! Other than those things, Halloween seems overdone to me. The excuse that girls (women, ladies, whatever term you use) have that it’s a holiday to dress slutty irritates me to death. This Buzzfeed post cracked me up when I read/looked at it. I could honestly see girls dressing in these costumes just because it’s Halloween! I’m more like the Cady Heron (#MeanGirlslove) of Halloween. To update on what has been going on since I updated last…Little Man’s language skills have progressed SO much! He says at least 20 words and is able to see something and know what it is, either by name (dog or car) or sound (meow or neigh neigh). He is able to tell us what he wants more, which is an AMAZING help instead of him just yelling because I’m not giving him what he wants. He still will not eat potatoes, except in french fry form. 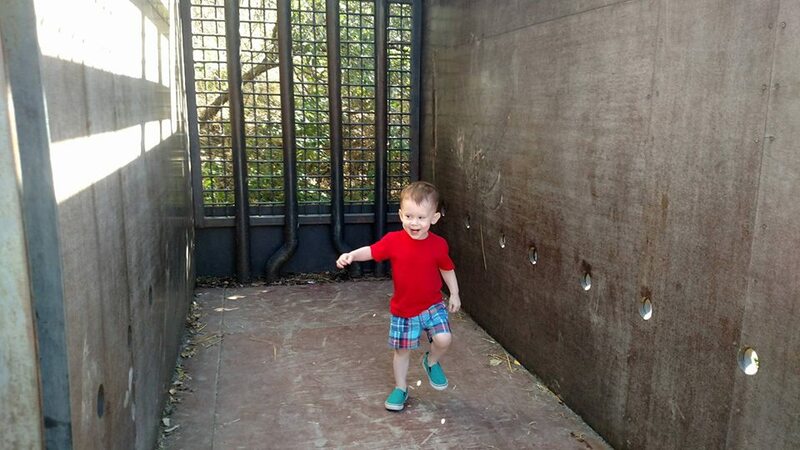 This past weekend, we took him to a local zoo and he had LOTS of fun. He got to pet some goats (he called them “neigh neighs” but close enough, right? 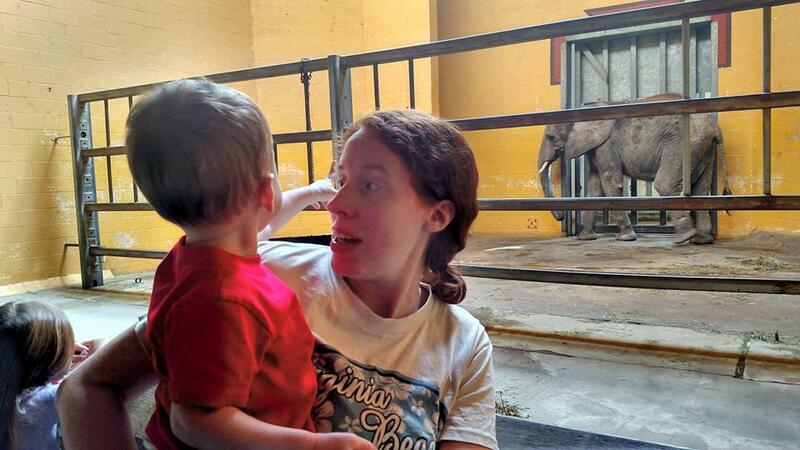 ), we saw a giraffe and an elephant from about five feet away, and he absolutely LOVED seeing the fish. Plus, he got to ride on his daddy’s shoulders so he was quite excited about that. He was sick at the beginning of this month and he’s still coughing (mostly when he wakes up in the morning or from a nap). It makes me so sad to have him sick but it doesn’t seem to be bothering him. As for the new baby (still unnamed), everything is as it should be at the 29 weeks I’m at. 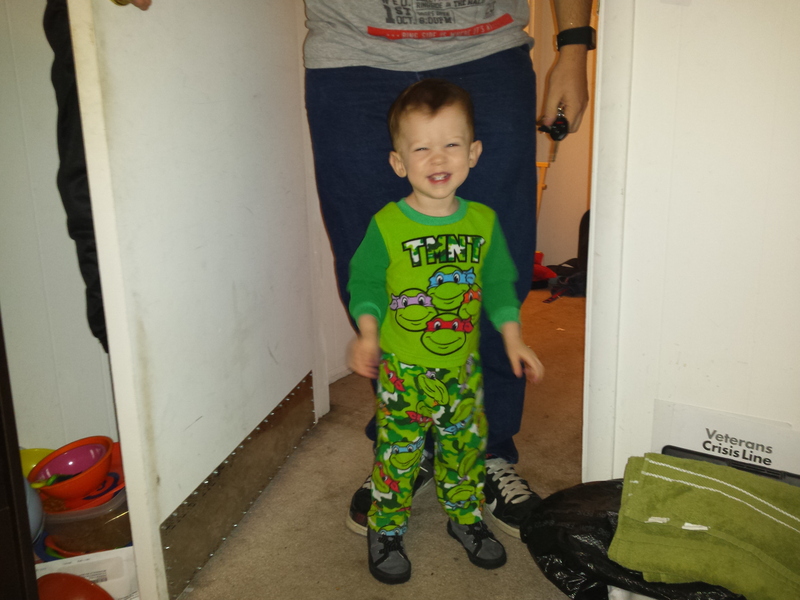 Hes growing like he should, moving a lot more than I remember Little Man moving, and causing heartburn for me left and right. It’s getting late and I’m hungry so I better go make something before bed. I’ll let everyone know how trick or treat went around the first of the month, but hopefully I’ll be updating before that. Happy Halloween! It’s the last day of the October Blogging Challenge so the posts from now on will be super random and crazy. Yesterday, I gave a sneak peek of sorts to Little Man’s Halloween costume. I didn’t dress up this year but I have big plans next year (hopefully they work out). 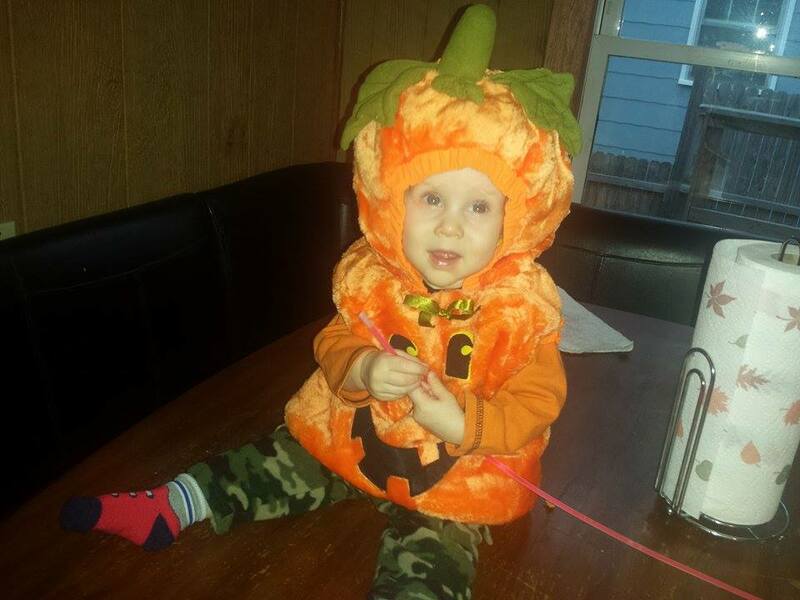 Like I said previously, I did NOT take my baby trick or treating, we just handed out candy.On to Little Man’s costume…he was a PUMPKIN! See how the orange shirt and camo pants kinda make sense now? He’s in the phase of copying people’s facial expressions so it’s hard to tell what he’ll look like in pictures anymore. He left the costume on for about half an hour then started getting fussy so we took a ton of pictures then took it off of him. 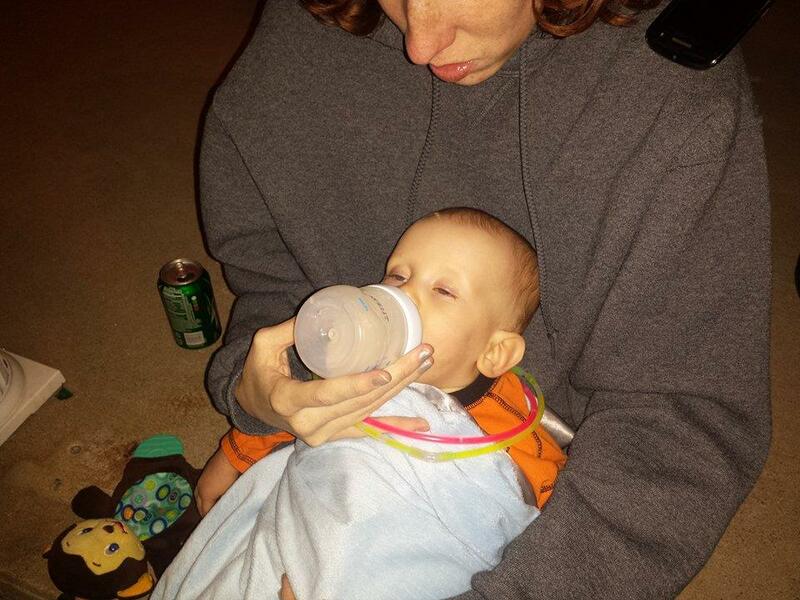 It turned out that Little Man just wanted a bottle. That’s our Halloween. How was yours? What did you dress yourself/family/kids up as? Let me know! See you back here tomorrow! Well, I’ve missed a few days again. I’m working on learning to crochet so I get focused on that and completely blank on writing for my blog or on the story I’ve been working on. I just posted the Wordless Wednesday post that I missed so I’ll fill in the rest of the October Blogging Challenge now! I don’t really have a favorite past Halloween costume. I was a cheerleader for a few years (stupid idea when it’s cold as all get out in late October) but other than that, I never really dressed up. My top 5 favorite workout songs are Think Good Thoughts by Colbie Caillat, It Stops Today by Colbie Caillat, You Make Me Feel Like A Star (Lizzie Mix) by The Beu Sisters, Whipped Into Shape from the Legally Blonde Musical, and Bellas Finals from Pitch Perfect. Mind you, the exercise I do to these is either dance around the kitchen, sing super loud while driving, or attempt to not fall while singing loudly in the shower. I have to be honest on this one, my most favorite thing about the holidays is the food. I’m a fat kid at heart (I would be in real life but luckily my genetics gave me a fast metabolism) so I love the fact that I now have to attend 3 Thanksgivings and 5 Christmases. Plus, I love seeing family, especially my side to see how much all the kids are growing (my son is the only grandbaby that visits often on my husband’s side). That’s my catch up post. Tomorrow’s post (weekend highlights) will be GREAT because I did something super exciting this weekend! See you then!